Hillary winning with Super Delegates essentially killed the 'Party Bosses' picking who the nominees were. Hillary Clinton won, and she had more super delegates, but there is little to no relationship between the two. She would've won without the super delegates. She would've won without the super delegates. Maybe or maybe not. They count for 30% of the vote. Eight months before the convention HC already had a big superdelegate advantage over Sanders. I believe that could have had an effect in swaying voters. The only people who cared about superdelegates were the Bernie voters who whined about them constantly. 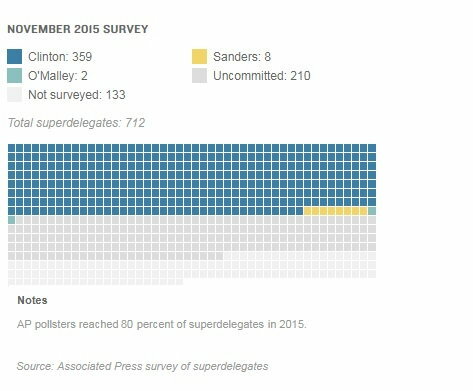 People saying superdelegates somehow swung the race are positing a significant number of voters plugged in enough to be aware of delegate counts but unaware enough to know that superdelegates are unpledged., and then casting their vote solely to be on the “winning team.” I just don’t think many people fall in that category. And of course the superdelegates— elected and appointed Democratic officials — supported the woman who had been involved in Democratic politics for decades over the guy who held his nose and joined the Democratic Party just long enough to not be nominated. Why would they support Bernie? And as long as I’m ranting, Dean underperformed dramatically in Iowa. That’s what sunk his campaign, not the scream. I'd go with Abernathy, but for some reason a lot of people don't like Death Proof. I heard Beto's mom paid 500k to get him into the primaries. NO THANKS! You must mean Robert Francis' Mom! Booker doesn't need to be president. He has already won at life. Must be frustrating if your Rachel Dolezal.Ridiculed by the press nationally for faking your identity,and then when one of the highest ranking Senator's does it on a grander scale and for a longer time frame the press gives them a pass and treat's them as a distinguished Presidential candidate. Warren hasn't gotten a pass -- not even close. Your post is hyperbole and hogwash. Last edited by AaronHernandez; 03-15-19 at 01:59 AM. There's no evidence that Warren received preferential treatment. The faculty members who hired her said that her heritage wasn't even discussed. They said it was not a factor. Should we listen to the people in the room or you? In any case, this issue was been extensively covered by the media, and there is no doubt that it has hurt her prospects for the Democratic nomination. Is that like being a FreeMason? 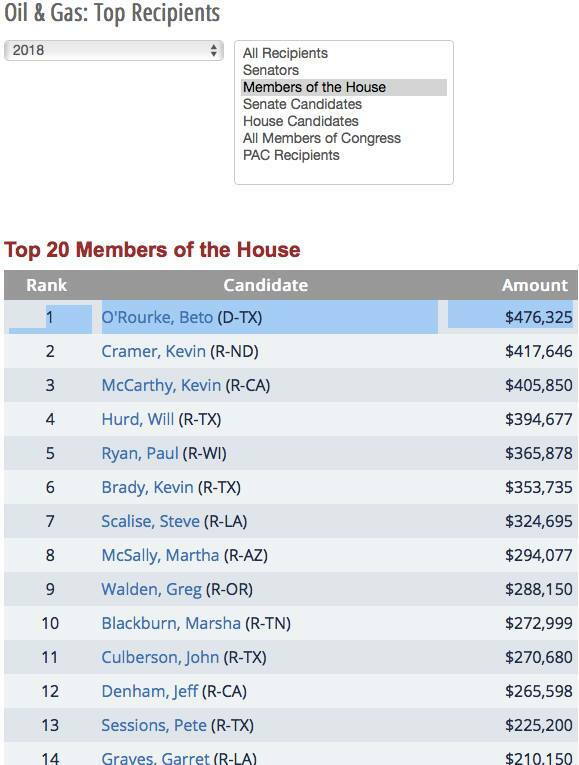 Beto got those contributions from individuals employed in O&G, but not contributions directly from companies or PACs. That isn't necessarily better... Just... Not quite what the list appears to suggest. Robert Francis has become the media darling. Many Democrats see a double standard in the fanfare surrounding O’Rourke’s 2020 campaign launch. Nobody, but nobody, is going to get elected with a name that utterly mockable. That's a sad fact. He might have the charisma, knowledge, and debate skills of ten other candidates put together, but the name kills his chances. I know, right? That's almost as bad as if he had some terrorist sounding name like Barack Hussein Obama!